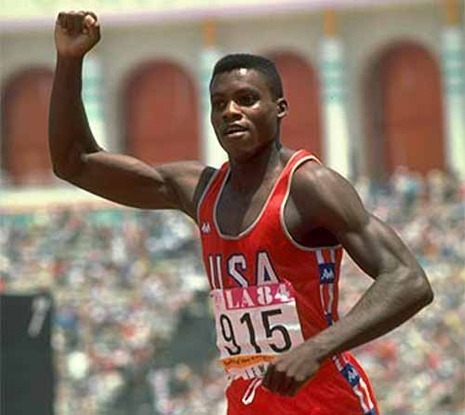 Carl Lewis matches Jesse Owens, winning 4 gold medals at the '84 Summer Olympics. Lewis was one of the biggest sporting celebrities in the world by the start of 1984, but owing to track and field’s relatively low profile in America, Lewis was not nearly as well known there. The 1984 Olympic games in Los Angeles would make Lewis a household name in America. Lewis and agent Joe Douglas, founder and manager of the Santa Monica Track Club of which Lewis was a member, frequently discussed his wish to match Jesse Owens' feat of winning four gold medals at a single Olympic Games and to “cash in” afterward with the lucrative endorsement deals which surely would follow. As it turned out, his first goal would prove to be far easier accomplished than his latter goal, at least in America. Lewis started his quest to match Owens with a convincing win in the 100 m, running 9.99 s to handily defeat his nearest competitor, fellow American Sam Graddy, by .20 s. In his next event, the long jump, Lewis won with relative ease. But his approach to winning this event stoked controversy, even as knowledgeable observers agreed his approach was the correct one. Since Lewis still had heats and finals in the 200 m and the 4 × 100 m relay to compete in, he chose to take as few jumps as necessary to win the event. He risked injury in the cool conditions of the day if he over-extended himself, and his ultimate goal to win four golds might be at risk. His first jump at 8.54 m was, he knew, sufficient to win the event. He took one more jump, a foul, then passed his remaining four allotted jumps. He handily won gold, as silver medalist Gary Honey of Australia's best jump was 8.24 m. But the public was generally unaware of the intricacies of the sport and had been repeatedly told by the media of Lewis’ quest to surpass Bob Beamon’s legendary long jump record of 8.90 m. Lewis himself had often stated it was a goal of his to surpass the mark. A television ad with Beamon appeared before the final, featuring the record-holder saying, “I hope you make it, kid.” So, when Lewis decided not to make any more attempts to try to break the record, he was roundly booed. When asked about those boos, Lewis said, "I was shocked at first. But after I thought about it, I realized that they were booing because they wanted to see more of Carl Lewis. I guess that's flattering." His third gold medal came in the 200 m, where he again won handily in a time of 19.80 s, a new Olympic record. And finally, he won his fourth gold when the 4 × 100 m relay team he anchored finished in a time of 37.83 s, a new world record eclipsing the record he helped set the year before at the World Championships.